Nice read Manisha. So your triangle is complete again:). Right now my Dad too is craving for Kale vatane and hunt is on here. I will be posting a gavar recipe soon. About the stackable vati many of us do the turn around and now I know it is a peer thing after all. Hmm...I haven't heard of kale vatane...must explore this mystery. I find the textural aspect of Maharashtrian food so different from Kashmiri. There is this combination of veges with lentils that are still firm - cabbage with chana dal, eggplant with chole, and now gvar with kale vatane! There are some unique como sin Kashmiri cuisine too, but it is pretty much everything cooked till soft! Other than the meat, of course! My MIL wd always complain that the gvar in Delhi was not quite up to the mark, and I have rarely cooked it. This season, I spotted a good-looking batch and finally got to cook with them. Chrome is trendy (and tradition)! Nice post, Manisha! And nice pix too. All of us wrestle with this possession thing on and off - don't worry too much about it! Right now, I'm in the 'discard' phase with regard to the house but keep looking for things like plates and bowls and dishes for the blog! 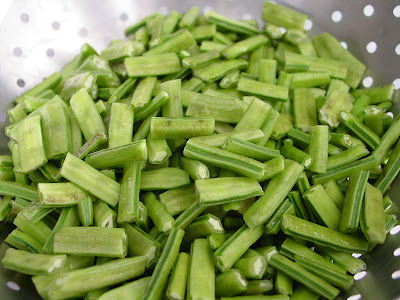 Manisha it feels as if you have a list of my favorite veggies and are posting them! 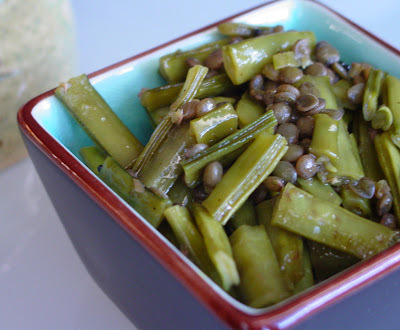 I tried and *loved* the nutty green beans. And what can I say about gavar? My dad and I are the only ones in the family who actually like this earthy vege. And my mum makes it exactly like how you described in your post - bhopla (which I didnt like too much), kale vatane (oohhh yummy) or by itself. Besides this we also had a man come to our home..I think it was for goda masala which my mother refused to buy from anywhere else. Wow, that loks fantastic. I need to try indian cooking it all looks sooo good!! mine . Since it is not a food post, hope it is okay for you. Just let me know if you want me to remove it. Just confirming. I also wanted to get some stainless steel coffee glass and even the man at the store told me that it was out of style. Mom used to make kale vatane amti and khandeshi khichadi with it. Both are absolutely delicious. I have seen the kale vatane in the Indian grocery stores in NJ. Manisha - great post. I have to go and find kale vatane to try it this week. Hope you and your family are doing OK! Jai Jai Maharashtra Maaza !! kale vatanechi usal ani Vade, few lemon drops and chopped onion. Control yourself HKG. Do you want us to send Kale Vatane from India. Anjali, hope you find good quality kale vatane. Kalya vatanyachi amti is also very delicious. The lust for stackable vatis arose when we had a cook together and I needed vatis for the various 'liquid' items on the menu. My friends brought rice bowls and ramekins but they were bigger than regular vatis and took up a lot of space on the table and made things a little difficult. Of course, no-one complained because we were having a really good time. Seriously though, I think that most of us with roots in the Konkan coast will have many similarities in cuisine, our way of life, our language, etc. But it would be fun to do the six degrees of separation thing and find out more! BTW, I am so glad you liked the nutty beans! It's a no-pain and quick recipe. Suzanne, welcome! 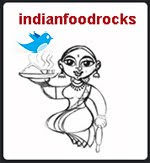 Do try my recipes as well as recipes of my fellow Indian food bloggers. It will open up a new frontier as far as flavors and textures are concerned. Best wishes with your blog! Inji link love is always welcome! And especially if it spreads awareness about copyrights and plagiarism. Gini, how they change their tujne, these men! I must ask for a clay pot the next time! But the next time I want to get it myself in my own 100lbs of luggage, and maybe, Medha's too! Vrushali, you will find yourself doing that about several other veggies and dishes, too. Not only do our taste buds mature as we grow older, it's also the memories that help with the turnaround. You must tell me where in NJ and which grocery store you found them in. My sister and I were talking about it the other day and she hasn't seen them either. Mandira, good luck and I hope grocery stores in Buffalo carry kale vatane. If not, use puy lentils. The best part I enjoy about eating in steel vatis is to read the etchings on it. Generally, they have a date and the name of the person. The couple of vatis that we have, are dated, 1953 and 1960. I assume they were given for my brother's "barse" and his "munj". However, I am unable to place the people whose names are on it. I am glad that my mother dumped them on us (alongwith other things steel) when we moved to the West. Curtains? That is in my list too! And clay pots? Of course! 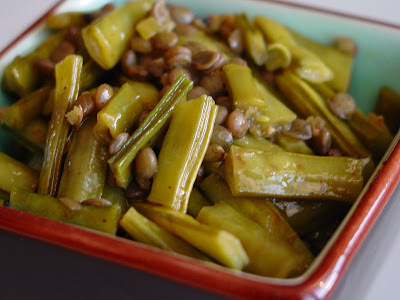 I haven't cooked with cluster beans much, but your recipe sounds great. As always, enjoyed reading your write-up. Hi Manisha! Hows it going in Colorado? Still being snowed in? Anyways, I just wanted to mention I posted a haleem recipe in my comments section in answer to your request. I haven't tried cooking from that recipe yet...but maybe I will, very soon. Very nice read Manisha...I eagerly await your posts - the thing about the old spice seller is touching! Haven't heard of Kale Vatane...but my feelings echo yours, when we are cooking the world in our kitchens, our heart feels good where there are good ol' tastes from our grandmom's kitchens in our food - food that takes us close to our roots often warms our soul more than any other! Interesting blog. Love this gavar recipe. I like it but not my kid's favourite so I make it very rarely at home. Now i think I should try this recipe of yours.Lemme tell u how successful it is at my home. Kalle Vatane are my dad's favourite and my mon used to make an usal with goda masala..YUMM !! Abhi, you made me look, too! My vatis were the plain ones and do not stack. They keep toppling over - sometimes in the middle of the night in the cabinet and I wonder if there are mice in the house! RP, thanks! 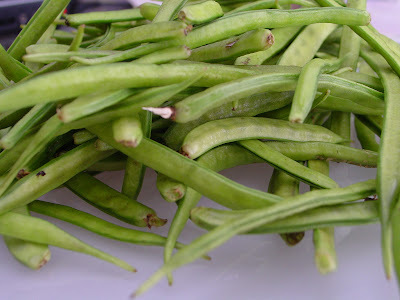 Cluster beans have a slight bitter taste, that's why we add jaggery (or sugar, if you don't have jaggery). Dilipbhai, I am sure your guvar recipe will bring back memories, too. A large part of my family is Gujarati. Nabeela, home is where your heart is and it's OK for it be "your own home", as you found out! I've been wanting to make your haleem ever since you posted it but every weekend brings new challenges. The snow really wore us down. You know me, I will make it and report back! Vrushali, hope all is well with you! Parsipanny, NJ. That's good to know! Sandeepa, thank you so much! I'm sorry I missed these last comments on this post. Life was very hectic and busy in Feb.
Nandita, you bet! And this feeling increases as you (well, I) grow older. There are things that I never paid attention to, that are coming back to me now. Linda, thanks! 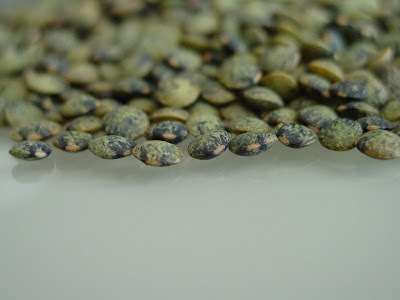 The lentils just need to be the sort that hold their shape, form and flavor when paired with cluster beans. Chetna, welcome! Kalya vatanyachi amti is the first thing I am going to make once I get my stock. Yes!! My friend Lee was in Texas and went to a huge Indian store called Taj Imports and actually remembered that I was looking for kale vatane. She called me to confirm that she had it right and she bought a packet for me!! Imagine that! I would love to share that with you, if you're interested. Let me know!